Dimensions 0.62 by 6 by 9 in. Amazon.com description: Product Description: A decidedly historic figure whose legend was increasingly magnified over the centuries, Zhuge Liang (Chu-ko Liang) has long been regarded as a brilliant strategist, commander, administrator, inventor, practitioner of the esoteric arts, originator of arcane wisdom, military thinker, and a sagacious king maker. His geostrategic insights rescued Liu Pei from extinction, resulting in ChinaÃ¢ÂÂs Three Kingdoms period, and his innovative tactics Ã¢ÂÂ including the Ã¢ÂÂempty city ployÃ¢ÂÂ -- reportedly resulted in defeating vastly superior, often befuddled foes. His escapades and achievements have become the subject of tales and novels, movies and tv serializations, and he looms large in war games and contemporary media. However, understanding his extensive military writings requires penetrating the myths and stories, discerning Chu-ko LiangÃ¢ÂÂs real accomplishments, and acknowledging his shortcomings. 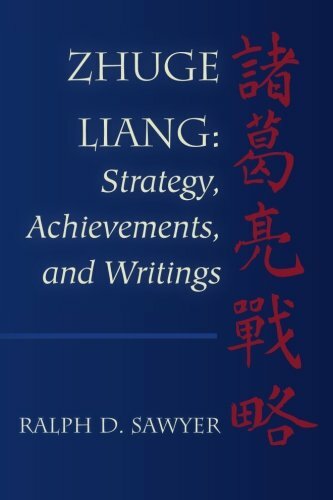 In addition to a complete, annotated translation of all his martial works and many of his missives and memorials, Zhuge Liang: Strategy, Achievements, and Writings contains an extensive historical introduction which outlines the military context, examines his strategic thought, and analyzes the numerous campaigns he personally directed after Liu PeiÃ¢ÂÂs death. Insights from the Art of War and other classic Chinese military works well familiar to Chu-ko Liang are employed throughout. About: A decidedly historic figure whose legend was increasingly magnified over the centuries, Zhuge Liang (Chu-ko Liang) has long been regarded as a brilliant strategist, commander, administrator, inventor, practitioner of the esoteric arts, originator of arcane wisdom, military thinker, and a sagacious king maker.